I have the privileged to learn how to make dumplings with my partner and her work colleagues. It’s a friendly and fun environment hosted by Angie the owner of The Humble Dumpling in Melbourne. Learning to make the dumplings from the dough up to mixing the fillings and sauces with The Humble Dumpling business. It’s a great dating idea to bring your potential date for a night out that’s fun and best best of all you get to eat the dumplings. 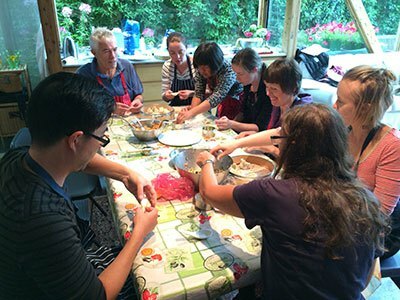 Each of us was given the option to choose the tasks that was needed to make dumplings such as mixing the dough, creating vegetarian filling, prawn and chicken filling, vegetarian spring rolls to making dumpling sauces. No one volunteer to take on the vegetarian filling so I’d decided to raise my hand to the task. Finely chopped all ingredients such as taro, carrot, shitake mushroom, cabbage and ginger then mix together in a bowl and ready to create dumplings with out dough. My partner and I had another plan to be elsewhere so we were in a hurry to leave before the class finished. We did managed to enjoy the prawn dumplings and vegetarian spring rolls. The experience was so enjoyable and I can recommend this as a dating choice to take out your partner out.